Manufacturer Spotlite: Cherish Doll | Doll-Lite! How did you get involved in the doll industry? I had been so interested in toys, figures, and dolls since my childhood, and it was a dream of mine to be an owner of a toy company. I love the BJD work, and think it’s great to help adults have fun like they did in their childhood. When did you start? Tell us about your company. We started in September 2006. We named it “Cherish Doll” with our hope that every doll owners keeps our dolls close to their hearts. What is your background? Have you had any special schooling (art school, sculpture, painting, etc)? Actually I had been an electronic engineer after studying at a university. When you were a child did you ever work on dolls or create with similar things? Yes, I liked figures and dolls! Do you have any other interests? Collections? Collecting coins from the world. Do you prefer working on male or female dolls? What types of dolls do you enjoy creating most? Why? I actually prefer boy dolls, and love mischievous type like Cynical Babies, one of our doll lines. Tell us about your products. What are your featured lines? We have Cynical Baby (12cm), Faith (21cm), and Hope (42cm) for dolls. Faith type would be our featured line. What products are you most proud of? Alley, because she is our very first doll. What items have been the most challenging to make and why? Angie and Joel, for having CherishDoll-like image; Girlish with MDS size. What do you want people to think when they look at your products? To open “offline” shops around the world. What are your favorite types of doll clothing/styles? Girlish style, which many women dream of. What’s the best thing about designing and selling Asian ball jointed products? It pleases us to help people have fun in designing and selling BJDs. How long does it take from start to finish on a typical doll (from concept to selling it on your website) to create and complete? It really depends on the type of dolls, but it basically takes around three months for a doll and around one year for a new size doll. Have you noticed any real changes in the doll industry since you started your business? If so, what have they been? 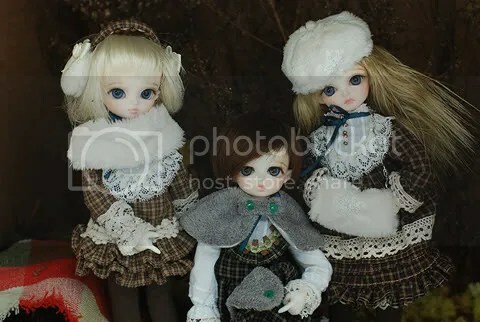 Recently the doll industry is getting globalized, and many BJD on-line companies are holding events in many countries. What sets you apart from the other doll manufacturers? At the moment, Cherish Doll is not very big size in comparison to other companies in the market, but we put great importance on offering good manner and kind service as well as high quality products. What do you think is the most exciting thing about the doll industry? BJD industry can offer much more freedom and chance to offer people to demonstrate their personality and thoughts than human fashion. That’s most exciting to give the opportunity! How do you feel about people modding your sculpts? We are very happy about that! We hope people create dolls into their very originals! Do you consider current trends when sculpting a new mold or do you follow only your inspiration? How important is customer feedback to your creative process? How large is your facility and how many people work for you in producing the dolls? Not really big, and we currently have 5 people that work here. What do you hope to achieve as an artist and company that would set you apart from everyone else? High quality for products and service. Thanks Cherish Dolls for the interview! We appreciate a glimpse into your company!